Jewish Wedding Photographers experience weddings that are grounded in tradition and culture. Jewish wedding ceremonies can vary, but common features will include a ketubah, the signing of the marriage contract; a chuppah, the wedding canopy; a ring owned by the groom and given to the bride under the chuppah; and the breaking of the glass. 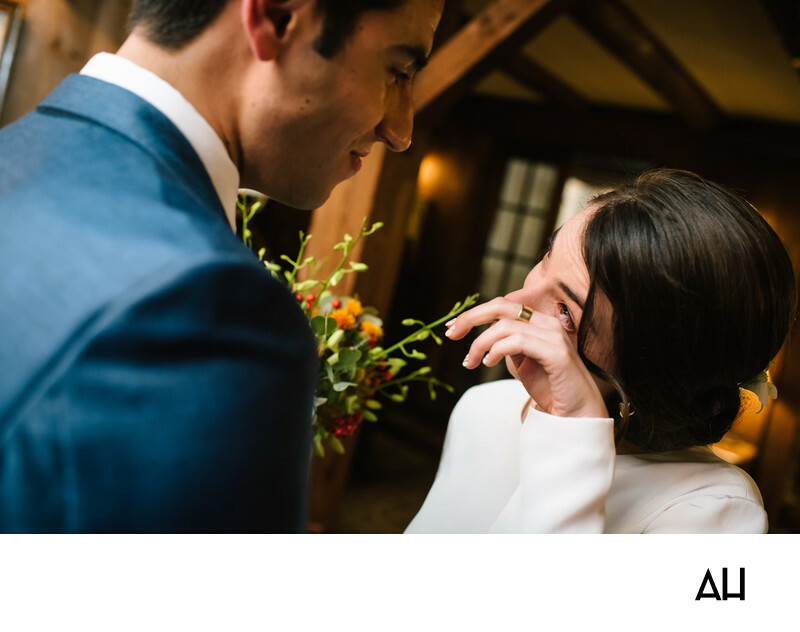 Jewish Wedding Photographers capture a variety of moments shared between the bride and groom: before, after, and during the marriage ceremony. This picture was taken at the lovely Quechee Inn at Marshland Farm, a beautiful venue that offers couples many natural settings that make their wedding day extra memorable. The photograph shows the couple together just after the ceremony, inside one of the buildings at the Quechee Inn. The image is one that depicts the emotions of the day and the love between the newlyweds. The groom stands before his bride and smiles down at her in pure adoration. His expression is overflowing with love for the woman in front of him. The bride smiles back up at him, happy despite the tears that spill from her eyes. She is not sad, she is overcome with joy. As another tear begins to form the bride takes her finger and delicately brushes the drop away. She looks into the eyes of her beloved and a small laugh escapes her lips. She finds it silly that she is crying when she feels so overjoyed, yet her husband finds it endearing. It is a tender moment; a sneak peek into a private moment between the bride and groom as they celebrate their union.